The Confederated Tribes of Goshute is one of the two bands of the Goshute Nation, the other being the Skull Valley Band. They are located southeast of Wendover, near the Deep Creek Mountains, and their 112,870 acre reservation, the Deep Creek Reservation, is in White Pine County, Nevada, and Juab and Tooele counties in Utah. The membership of the Confederated Tribes is around 400. They are one of the Shoshonean (Numic) speaking groups of the Intermountain West, and although they feel that their language is gradually being lost, the older members who know it are trying to keep it alive. According to the Goshutes, they have always lived in their current desert region. Scientists argue that they migrated there from the Death Valley region about 1,000 years ago. They have been effective hunters and gatherers, looking after their land while living in some of the most arid climate. White settlement began in the 1850s with the arrival of the Mormons, leading to conflict and federal government efforts to remove the Goshute Indians. 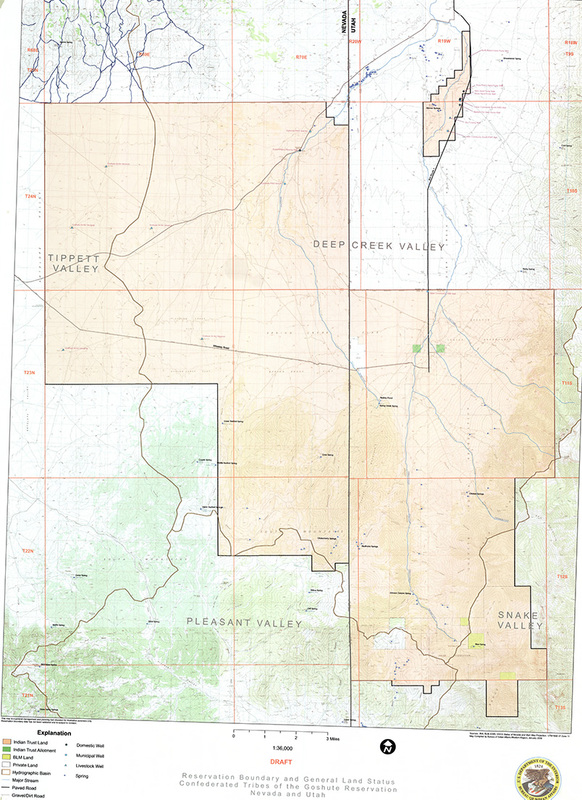 They failed in their attempts and it was not until 1914 that the Deep Creek Reservation was formed. Although this ensured the Goshute ownership of their own land, their way of life was changed when federal agents promoted agriculture, a large change from their usual efficient use of wild plants. The harsh desert land could not support this change, and since then the Goshute have turned to other sources of economic opportunity. Currently, the Goshute of the Deep Creek Reservation manage an elk herd, where they profit from hunting permits.